Are you in need of a little inspiration for your invitations? If so, read on to learn the top invitation printing ideas. Nowadays, everyone gets an e-mail to let them know about everything. With 281.1 billion e-mails sent and received each day, it can become a dull ordeal to go through one’s inbox. Your invitation may even get ignored or glanced over. However, if you choose to let people know about your upcoming event with a printed, hand-made invitation, it will be a refreshing break from e-mails for them. They also add a touch of class and uniqueness to your event. Here are 7 of the best invitation printing ideas to inspire you with. We know how stressful it is to plan an invite list, so let us save you some trouble and read what’s below. Your invitation can have anything as its primary focus. And with the help of abstract design, you can put emphasis on anything. Abstract designs are perfect for those who are daring enough to break formality. Consider the use of this idea if you want to break the mold and surprise people with an out of this world art design. Also, you can even include the card itself for the design. Doing this can help you customise your invitation template to suit the theme you are going for. This will also make your invitation stand out from the rest. Use this idea if you feel like showing your artsy and quirky side. Show your guests the kind of fun they can expect from the invitation alone. Instead of having generic infographics printed on your invitations, have a photo of you on it instead. Taking photographs to compile for an invitation gives it a unique twist. The invitation’s tone is also yours to control with this idea. This is a great idea to use if you plan on sending invites only to people you are close to. An intimate gathering, for instance. You can also have your friends and family join in. A photo collage for an invitation is a great way for you to express the tone of your event. With a great idea to execute this in mind, you can send a clear message without words altogether. Your photos don’t need to focus on people. You can take a photo of anything that suits the event and you can use that as your focus. Also, you can add some filters to your photos to have an extra amount of uniqueness added to it. One more trick you can use is an extreme close up. You this if you don’t have many subjects to photograph. This can turn a simple object into a beautiful focus for your invitation. Other than those, these are also a great way for you to save on your invitations. Many customised designs, including your own photos, print at a lower price than generic invitation templates. If photographs aren’t your forte, then you should consider using words instead. These kinds of invitations focus more on using words to paint a picture of what the event will be like. To do this, you should focus on what fonts are available for you to use. They can turn a simple sentence into something that can make your message more impactful. Test out different fonts to see what suits your event the most. Exert some extra effort and use letters to make an image. This is one way for you to step up your game and wow your guests. 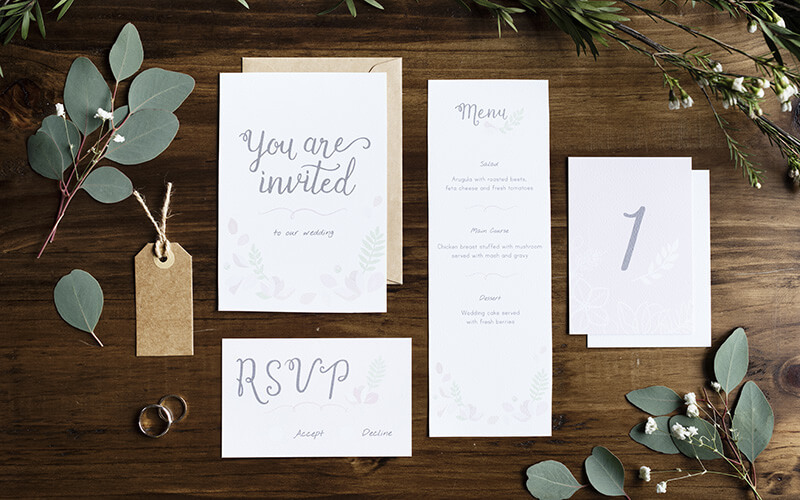 Using texts as your primary medium makes your invitation easier to print out. So, you are sure to save some time and even money if you go for typographical invitations. A rising trend among invitations is having children do them for you. This is a neat idea if the event you’re planning has a guest list of people with children. This is a great idea for you if you don’t have much time to plan and make your invitations. Instead, let your children’s whimsical and creative nature do the work for you. Invitations like these make for a great party favour as well. Many people like the idea of having formal invitations made by children. They love it even more if they know you left the children to their own imaginations. All you need to do is to provide them with any art materials they need. You also need to set a template for them to follow. Sometimes, fewer words say more. These invitations show a great example of it. Minimalist invitations add a degree of class to your event. These kinds of invitations make your event seem important and classy. Which makes it perfect if your event is a type of high-class engagement. These kinds of invitations help lend focus to what’s important on the note, which makes them perfect to let people know about the event’s details. People tend to focus on images and other features an invitation has, having these cut down the clutter that may distract people. An invitation like this also challenges you. Having to think of more ways to draw attention to a single element while being creative forces you to think outside the box. This raises your creativity, attention to detail, and your skills as a promoter all at the same time. If you plan on having a themed party, then consider having party invitations that tie well together with the theme. These let whoever you’re going to invite know you know how to plan a party. They will know you’re a fun person the first time they take a look at the invitation you made. It’s a fun and creative way to challenge yourself to come up with ideas. This is much like how you design a brochure. This takes all the elements of your event and places it in a detailed invitation. This is a great idea if you want your guests to know what to expect from your party, the venue, if there will be a band, and even about the food served in it. Fitting everything in a folded invitation gives it a touch of class and makes your event look fancy and it’s also a terrific way to make the details of your event entertaining to read. These invitation printing ideas are sure to wow your guests and to make your event the talk of the town. Go and design your invitations now! If you have any questions about invitation ideas, don’t hesitate to contact us here.